The origin of the pomegranate extends from the Balkans to the Himalayas; it is considered as one of the most cultivated fruit trees since ancient times so there is a great genetic diversity as a consequence of its propagation by seeds that germinate easily. It was introduced long ago in the Mediterranean region; it is assumed that the Carthaginians took the plant to southern Europe. Theophrastus described this tree around 300 B.C. and Pliny referred to it as one of the most valuable fruit. Currently this tree is naturalized in the Mediterranean region, South America and the southern United States. The economic importance of the pomegranate in Spain is remarkable because it is one of the major producers of pomegranate in the world, whose fruits besides supplying the domestic market; are exported to Central Europe. Spain is Europe's largest producer and exporter of pomegranates; doing the crop more or less profitable. Currently, pomegranate cultivars in Spain exceeds to 2,500 ha, with a production close to 20,000 t. This production is concentrated mainly in the province of Alicante. It is an alternative fruit tree to many areas, especially where poor soil conditions or the poor quality of irrigation water prevents the profitable operation of other fruit trees; this does not mean that if it is cultivated in better conditions the results are not good. However, these features should not lead to confusion since in reality pomegranate growing has a specific problem that must be considered in order to achieve quality fruits and abundant crops. In Spain, it is a common practice that pomegranate is combined with other fruit trees such as fig tree and date palm, occupying most of the cases the worst terrain. The marketing of pomegranate as a fourth class product and its use in making jams, jellies, juices, etc., are becoming more important. - Small deciduous tree, sometimes shrubby, 3 to 8m, with a twisted trunk. Hardwood and flaky bark gray. - Stems: Quadrangular or four narrow wings and later become round with greyish brown bark. Especially small axillary branches are spine-shaped or end in a sharp spine. - Leaves: Oblong, simple bright green slightly leathery with short petiole. They develop opposite or nearly opposite to the branches or clustered. They have an apical nectary secreting sugars; stipules are rudimentary and difficult to appreciate. - Flowers: Hermaphrodite, solitary or clustered in groups 2-5 at the end of the new branches and 3-4 cm in diameter. 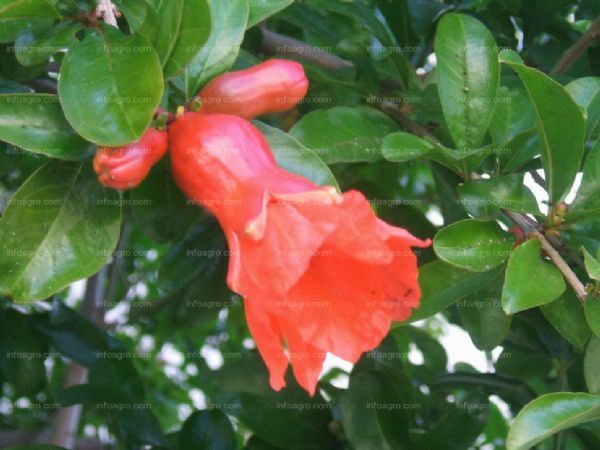 They are big and bright, glossy red, bell-shaped, with 5-8 petals and sepals, calyx persisting in fruit. In some varieties the flowers are mottled and are tinged in white. It flowers in May to July, although some varieties flower later. - Fruit: Globose berry, shiny red, yellowish green or whitish, rarely violet when mature, with the calyx, 5-8 cm in diameter, filled with seeds and has a leathery shell. The seeds are angular and hard on the inside, the outer layer of the seed coat is covered by a thin layer or juicy pulp, red, pink or yellowish white, astringent, sour. The best climate for the pomegranate is subtropical and even tropical, so in these weather conditions is where higher quality fruits are achieved. In these latitudes the period of high temperatures coincides with the fruit ripening of the pomegranate. - Temperature: The optimum temperature for the pomegranate is between 18-25�C, preferring a warm climate before cold weather. Usually, like all subtropical or tropical fruit, it cannot withstand cold weather but there are some species in this genus that can withstand -15�C. Frosts cause more damage the longer they are delayed. - Lighting: Good lighting must be ensured to allow the fruits to fully develop their coloration. Therefore, it prefers sunny and sheltered places. The pomegranate is not demanding of the type of soil but it does not grow in clay or compacted soils. However, it grows best in deep soils; it suits the floodplain. Alkaline soils are favourable; even excess humidity favours its development. The ideal soil should be light, permeable, deep and fresh. It is indifferent to the alkalinity or acidity of the soil. Under these conditions it is when its fruits are of the highest quality. It is tolerant to drought, salinity, active limestone and iron chlorosis. In drylands, drought at the time of flowering can cause flower drop and reduce the harvest to the minimum. On irrigated land, its water requirement is very low. However, excess watering shortly before the fruit ripening phase can cause fruit cracking. The pomegranate is propagated by seed, by cuttings, by layering, by offshoots at the base of the tree and by grafting. Seedbed takes place in spring, in the nursery garden, with seed collected in the same year. It should be chosen for this operation, grains of acidic and late maturing varieties. These varieties are more resistant than those with sweet fruit. Although pomegranate seeds germinate easily and without much delay, this propagation method is rarely used and is not recommended due to the long time needed and not all varieties are adapted to it. Cutting is the most used form of multiplication in pomegranate. Propagation by cuttings is simple and works well. In February or March, cuttings of 20-25 cm long and 0.50 cm thick are cut. They are placed in the nursery in such a way that only a bud is above the ground, all others remain buried. The cuttings will root easily and quickly and they can be transplanted in the next spring, although it is recommended to leave them in the nursery for two seasons. Sometimes cuttings are cut in autumn; they are preserved in sand during the winter and are placed in the nursery in the spring. This promotes greater vigour and growth of the aerial part, but at the expense of the roots, which are less developed. The layering is rarely used, being in simple layering and layering in stump. Propagation by offshoots at the base of the tree is fairly easy to obtain, as the pomegranate produces offshoots in abundance. A year after planting, grafting is performed. The ideal time is from mid-April through June. Veneer grafting is usually done in pomegranate. Two buds with a little bark in a single branch are taken of the variety to be grafted. In the stock, an opening with single or double flap is done; the sheet is placed with two buds and tied with raffia and the buds may even be covered. At 15 or 20 days, the raffia is cut and the bark or the flap is removed, leaving two buds in sights. The genotypic diversity of species is very large. Selection processes are relatively recent. - Low number of male flowers. - Flowering period and grouped harvest. - Fruits with few seeds. - With early small branches. - Sour: the fruits are sour; it is the most valued stock by farmers. - Edges: usual varieties are used; edges from the cuttings of the offshoots produced by the pomegranate, which is cut at ground level. - Resistance to drought and salinity. - Tolerant to root suffocation and active limestone. - Low production of tillers. - Common pomegranate which has sweet fruit. 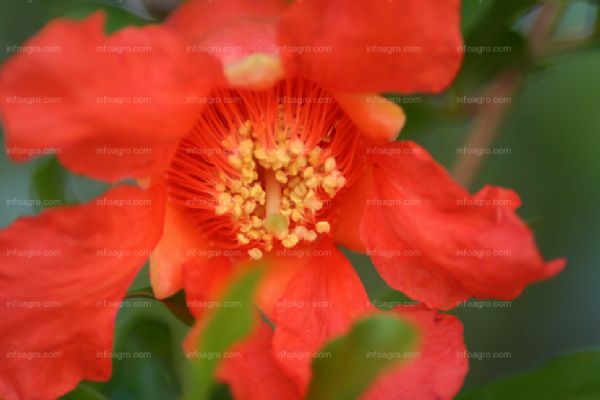 - Sour pomegranate whose flowers are used for decoration. - Seedless pomegranate. This variety is produced in the Middle East. �Mollar� of Elche. very vigorous tree, rapid development, large fruit size, thick grains, dark red and very small and soft seeds. It ripens between October and November. It is of higher quality, higher calibre and more productive than the Valencian group; presents significant chance of cracking and pest attack. It is the most widely grown variety. �Mollar� of Valencia. 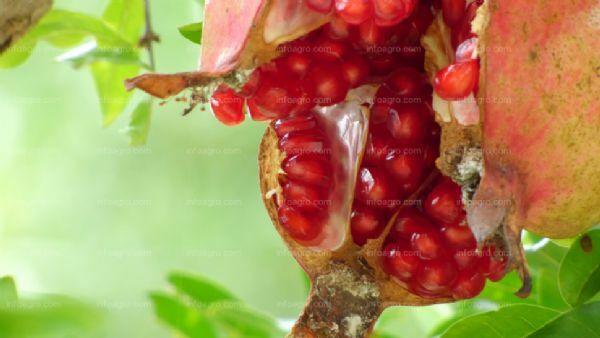 Vigorous tree, large fruit size, rounded and flattened, thick pomegranate and very small seeds. It is characterized by early harvesting. The prices of sales are often significantly higher due to the shortage of product at the time of harvest. Wonderful. One of the most cultivated variety worldwide. It has bittersweet seeds with hard gear, attractive colour red which is used for industrial use, not fresh. Relatively low productivity. - Native clones in South-eastern Spain: PTO1, PTO7, CRO1 and ME14. The best planting time is spring, particularly in February and March, in the state of two year-old seedlings. First, a profound hole of about 50cm is made to aerate the soil while maintaining soil moisture. Later manure is added with a rotary tiller. The traditional setting for planting is 6 x 4, but in the new plantations tend to be 4 x 2 meters. After marking the spot, make holes with a depth of 40cm and each rootstock is placed, pulled out a day before from the grounds or nursery, and also with bareroot. Before placing it into the hole, its upper part is pruned to balance the two sides. During the first years of cultivation until the beginning of full production, it is irrigated by furrow with endowments of 600-800m3/ha. When the tree comes into full production, at 6 or 7 years after grafting, irrigation by flooding is the most used (with a dose of 900-1200m3/ha), in this case it is often given a field work after each watering, applying previously fertilizers. Normally it is irrigated four times throughout the year. In modern plantations drip is employed with a flow rate of 4 litres/hour. Watering must be removed completely from the beginning of the fruit ripening to avoid cracks in the rind of the fruit, which is depreciated in the market. 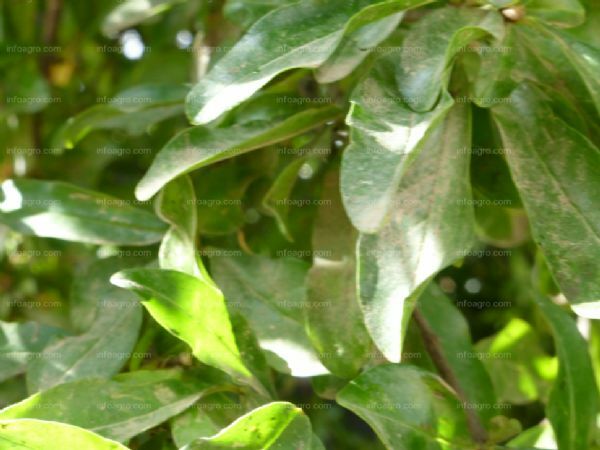 The pomegranate is not very demanding in terms of fertilization; the leaf fall is the optimum time to provide phosphate and potash fertilizers, and at the time of entering into vegetation, nitrogen balanced formulas. - 216 U.F. de N.
- 150 U.F. de P2O5. The organic matter inputs are used in the traditional growing areas. In case of soils with high content of active limestone and salinity, chelate of iron is applied. - It should be kept in mind that excess nitrogen in young trees is usually harmful because it causes very long and weak formations, which by its own weight can be arched in excess, and sometimes even can cause the breakage of the new branch. Also, if excess nitrogen is accompanied by water imbalances, it may increase the cracking of the fruit before the time of maturity. It can also negatively influence colour development. - In low crop trees, excessive nitrogen fertilization causes increased vegetative growth, which can reduce next year's crop. - Potassium exerts a beneficial effect in reducing fruit cracking. The first field work is done in the winter months, usually in January, with the field tiller, for a more spongy soil, whose goal is the elimination of weeds and preparing the ground for irrigation. Sometimes a rotary tiller is used to bury manure and fertilizers that are added into the field. In spring the cultivator is used to remove weeds and get a better evapotranspiration. Herbicides are also used. Every time these activities are less necessary due to the introduction of drip irrigation. It starts from a seedling from which the buds have been removed from the trunk to a height of about 50 cm from the soil. Previously 2 or 3 buds are chosen to develop its branches and growing them, giving the pomegranate a cup-shaped. The tree produces shoots and vertical shoot axis at the central and basal parts which should be removed to enhance growth of the tree and the fruit. It consists of a simple thinning of intersecting branches because of the large number that are produced each year. Sprouts grown that year are also to be cut, if there is no need to remove a broken branch or branch attacked by Zeuzera pyrina. In this case one of the shoots is chosen to replace the broken or diseased branch. This pruning aims to improve fruit quality and to increase production by enhancing the tree to bear more fruit not only in the periphery. Through this pruning, rejuvenation of the pomegranate is achieved. It is done when low production is observed until a complete renovation of the branches. Generally, it should not be more than 3 years. For this reason, 1/3 of the old branches are taken away each year. - Elimination of shoots and shoot axis. The pomegranate because of its great strength, develops around its trunk many buds and shoots axis that should be removed when they appear, without leaving them to grow as they are unproductive buds and consumers of sap. It takes place from June to July to improve the lighting of the fruits. This improves colouring, reduce winter pruning costs, improve phytosanitary application, and will eliminate competition for nutrients. It is essential for fruit quality. 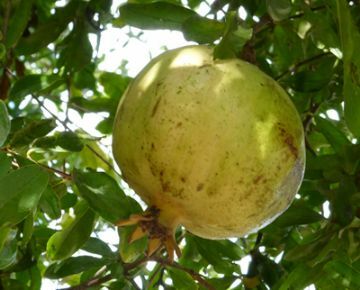 It aims to eliminate fruits that may be affected by the sun, which may have lost its taste and therefore market value, so it is recommended to remove them and enhance the growth of the tree. Through fruit thinning, fruit size is also controlled because if there is an excess in fruit number, small and less commercial fruits are obtained. Usually one or two fruits are left by pomes. Thinning is usually manual after fruit set during the month of July and usually done two times, with an interval of 20-25 days between them. Damages are holes in the trunk, forming galleries reaching the central cylinder and even kill the tree. The treatment is performed in winter (December, January) with phosphorus oils. They are small insects that burrow galleries into the bark of the pomegranate. Attack the sprouts, flowers and fruits; cause the fall of flowers and fruits which weaken the tree and make it prone to attack by other pests. Their attacks are not economically important. They appear in pomes and crown of the fruit. The attack is seen through the colour of soot left in the pomegranate. The treatment is done in winter (December, January) with phosphorus oils. Fruit rot is the most important disease of the pomegranate. It is a cryptogamic disease that causes pulp rotting, also affects the walls and membranes, converting everything inside the pomegranate into black colour, and the skin is remain intact, since this disease penetrates through the pistil. There is no remedy to combat the disease, although they can make sprays with fungicides based on copper and Zineb to prevent it. The symptoms of the disease are manifested with necrotic spots on the fruit surface, surrounded by a pinkish halo. The development of this disease is favoured by spring and summer rains. Both pathology can cause losses of up to 30% of the crop. - Pomegranates damaged by direct sunlight. This disorder is caused by strong sunlight. They appear in the fruit barks small cracks and a brown to black colour spot in the affected area. It has an unpleasant sour taste. It is believed that fruit cracking occurs as a result of water imbalance between the growth and ripening stages. This problem is accentuated in dry years. With drip irrigation, by avoiding these imbalances, fruits are of better quality and more uniform. Potassium has a favourable effect in reducing fruit cracking. Harvesting begins in mid-September (for the earliest varieties) when changes in colour occurs in fruit and ends in mid-November (for the later varieties). Two or three times due to non-uniform ripening process, since flowering is staggered. Harvesting is done manually, using secateurs with smaller blades and taking the greatest care, since the fruits are sensitive to knocks. - When harvest is advanced, the fruits are still green, being of lower quality and will eventually wrinkle. - If harvesting is delayed, there will be more open pomegranates and therefore have less commercial value. Average harvest yields per hectare are 3 kg/tree in the third year and 30 to 40 kg/tree in full production. - Absence of growth cracks, cuts, bruises and rot. - Colour and smoothness of skin. - The taste depends on the ratio sugar/acidity, which varies among cultivars. Soluble solids content greater than 17% is desirable. - Containing less than 0.25% tannin is desirable. At 5�C for up to 2 months; for longer storage, use a temperature of 10�C to prevent damage from cold to avoid chilling injuries. 90-95%; pomegranates are very susceptible to water loss which produces wrinkling of the pericarp. Storing the fruit with a coating or plastic lining or the use of waxes can reduce water loss particularly in conditions of low relative humidity. 2-4ml CO2/kg�h at 5�C, 4-8ml CO2/kg�h at 10�C, and 8-18ml CO2/kg�h at 20�C. To calculate the produced heat, multiply ml CO2/kg�h by 440 to obtain BTU/t/day or by 122 to obtain kcal/metric t/day. Less than 0.1�l/kg�h at 10�C and less than 0.2�l/kg�h at 20�C. Exposure to concentrations equal to or greater than 1ppm of ethylene, stimulates respiration and ethylene production rate, but does not affect the qualitative characteristics of the fruit. Pomegranates do not ripen after harvest, so it must be harvested fully ripe to ensure the best quality for the consumer. - Effects of controlled atmospheres. There have been very few studies on the effect of CA on pomegranates. If stored below 5�C, the concentrations of 2% O2 help reduce chilling injury. In one study, it was possible to successfully store pomegranates at 6�C in an atmosphere of 3% O2 + 6% CO2 for 6 months. The pulp that surrounds the seeds mitigates the heat and thirst because it has a nice sourly sweet taste. The juice is refreshing and pleasing, and possibly its best-known commercial product. It is used to make syrups, jams and ice cream. The pericarp, rich in tannin and colouring matter, is used in tanning and dyeing. It is also used in pharmacy for its astringent properties-malicorium. Drinks made ​​with the juice of the integument pulp seeds, diluted in water, are very hygienic and refreshing. The root bark has alkaloids like pelletierine of vermifuge properties, used to expel tapeworms and other intestinal worms. 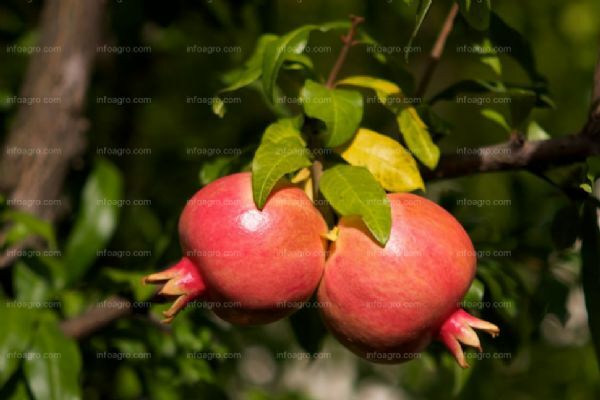 The pomegranate is also used in landscaping as an ornamental tree or to the formation of very thick and beautiful hedges; for this purpose Punica granatun cv. Nana is used. It is a dwarf variety that normally does not produce fruit but has many beautiful flowers.